Israeli police clashed Sunday with Palestinian protesters at Jerusalem's Al-Aqsa mosque, as Jews visited the site they revere as the Temple Mount on an annual day of mourning. Palestinians threw stones and fireworks at Israeli authorities as police fired stun grenades to quell the protest in Jerusalem's old city. Security forces briefly entered the mosque to restore calm and locked the demonstrators inside. There were an undisclosed number of arrests and injuries in the clashes. 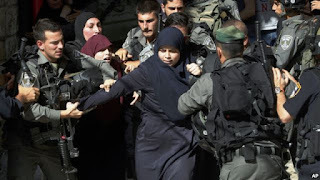 One witness said about 300 security personnel entered the compound to confront a couple hundred Palestinian protesters. It was the first time security forces had entered the mosque since last November, when similar confrontations erupted over the site that Jews regard as their holiest and Muslims their third holiest, after Mecca and Medina in Saudi Arabia. The Palestinian foreign ministry condemned Israeli authorities for what they said were "provocative" visits by devout Jews to the site. Visits are allowed, but Jewish prayers at the site are not.